Norway-based shipping company Fjord Line’s Stavangerfjord represents a new-generation of advanced and environmentally friendly Cruise Passenger Ferry with outstanding passenger facilities in order to operate both as a day and night ferry. The vessel is built to provide passengers with pleasant experiences, even under the harsh weather conditions of the North Sea. A modern and flexible interior design provides a capacity for 1,500 passengers (1,200 passenger during winter), and a total of 306 cabins on two decks provide first class accommodation and a variety of restaurants, shops and entertainment to enable travelers to have an enjoyable sailing along the Norwegian coast line to Denmark. Stavangerfjord is touted to be the most environmentally friendly passenger ship in international operation, as it is powered by pure natural gas enabling a complete elimination of SOX emissions as well as reducing the CO2 emissions by 23%, NOX emissions by 92% and particulate emissions by 98%, compared to ships powered by traditional heavy fuel oil. The Waste Heat Recovery System provides both electricity from a steam generator and heating from warm water in the accommodation areas. The 170 x 27.5m ship provides a service speed of 21,5 knots. Norway is trailblazer in several maritime areas, and has emerged as an early leader in the design, construction and operation of vessels with gas propulsion. Today there are about 35 RoPax ferries and offshore supply vessels in operation which are powered solely by gas, but none as large as the 170m Stavangerfjord. Consequently the supplier industry followed the challenge and today has an appropriate array of ship engines available, either for the main drive as well as for the electrical onboard network. Norway’s classification society Det Norske Veritas (which is now DNV GL courtesy of its merger with Germanischer Lloyd), among others, have worked to establish the necessary building regulations, building a knowledge database and experience from the operation of gas powered ships which now stretches more than a decade. Consequently the new ferry has been built under the survey of the DNV and has been stamped with the class notation: DNV+1A1, Ice 1B, CAR FERRY A, EO, Clean, Naut-AW, VIBR, MCDK, TMON, F-M, COMF V(2). The Norwegian Bergen Group Fosen AS shipyard built the cruise ferry Stavangerfjord to its owner Fjord Line AS, based in Egersund, Norway. 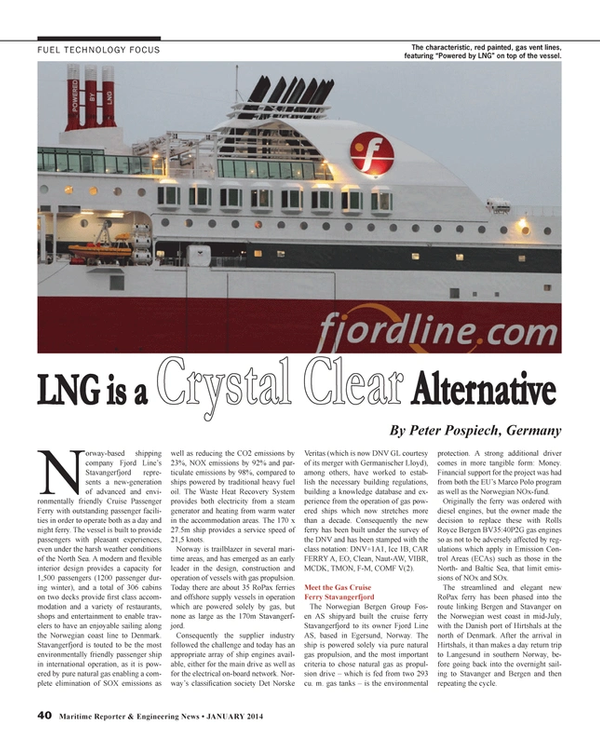 The ship is powered solely via pure natural gas propulsion, and the most important criteria to chose natural gas as propulsion drive – which is fed from two 293 cu. m. gas tanks – is the environmental protection. A strong additional driver comes in more tangible form: Money. Financial support for the project was had from both the EU’s Marco Polo program as well as the Norwegian NOx-fund. Originally the ferry was ordered with diesel engines, but the owner made the decision to replace these with Rolls Royce Bergen BV35:40P2G gas engines so as not to be adversely affected by regulations which apply in Emission Control Areas (ECAs) such as those in the North- and Baltic Sea, that limit emissions of NOx and SOx. The streamlined and elegant new RoPax ferry has been phased into the route linking Bergen and Stavanger on the Norwegian west coast in mid-July, with the Danish port of Hirtshals at the north of Denmark. After the arrival in Hirtshals, it than makes a day return trip to Langesund in southern Norway, before going back into the overnight sailing to Stavanger and Bergen and then repeating the cycle. At the end of 2013 the sistership Bergensfjord will be placed into the same service allowing the company to offer daily departures throughout the year on the Bergen / Stavanger / Hirtshals / Langesund routes. The design of Fjord Line’s two cruise ferries grew from a close collaboration between Bergen Group Fosen and Falkum Hansen Design. The concept for the ferries combines daytime and night operation with certain decks, 6 and 7, serving as common areas that are characterized by intimacy and flexibility, while other decks, 8 and 9, are clearly defined as locations for cabins in standard and more luxurious versions. The design and interior support the special logistical considerations of 24 hour a day operation and food services. For passengers, MS Stavangerfjord and MS Bergensfjord should appear as nothing less than a floating dream. The architect firm Falkum Hansen Design specializes in the design of passenger ships. The basis of the thinking behind the interiors of Fjord Line’s ships has been a desire to create a distinctive signature, a brand that makes these cruise ferries stand out from other ships in the same category. The vision was to create a ‘Lifestyle Liner’ based on the values associated with intimacy, signature, maritime and liner. The hulls of both the new cruise ferries are designed in a way that reduces water resistance and increases stability. This contributes to greater comfort on board in high seas and reduced fuel consumption. The wave-neutralizing effect is enhanced by a large bulb at the bow of the ships. The length of the ships will result in the crossing between Norway and Denmark being much smoother than normal. In the North Sea, the average length of three waves together is 65m. The cruise ferries are 170 meters long so they will float on three waves instead of dipping down between the second and third wave. This will contribute to a much more comfortable trip. To make the voyage more comfortable for the passengers in the very often harsh conditions of the North Sea’s Skagerak area retractable stabilizer fins are fitted to reduce slamming and rolling. The ship is a two CCP propeller design. Each shaft features two gas engines which are mounted on both sides of one Renk MAN gearbox. A Marelli shaft generator is mounted additionally on both the gearboxes. The vessel is powered by four natural gas engines of type Rolls-Royce Bergen B35:40V12PGas. The 12-cylinder, V-configuration units deliver 5,400 kW at 750 rpm each, 10,800 kW total. All the Rolls Royce gas engines are pre-chamber spark ignited lean burn engines according to the Otto cycle, the ignition of the main charge takes place in the pre-chamber with, a so called, rich mixture. Fuel (gas) consumption has been recorded by the ships crew of approximately 126 kg per nautical mile in total for all four engines. “This is a well-proven technology, produced in Norway, that has been used on a number of ferries and ships used in the offshore industry. In addition to meeting important environmental considerations, natural gas operation will be more cost-effective than heavy fuel oil,” said Fjord Line’s CEO Ingvald Fardal, in explaining the choice of Rolls-Royce powerplants. Fardal said that emissions of sulfur from shipping in Northern Europe starting in 2015 cannot grow by more than 0.1 percent. Natural gas contains no sulfur or heavy metals. It reduces CO2 emissions by 20-30% and emissions of NOx by around 90% compared to heavy fuel oil. After 2015 the only alternatives to natural gas will be diesel with extremely low sulfur content, or investing in expensive scrubbing technology that removes the emissions from the combustion of heavy fuel oil. Natural gas is also expected to be the most cost-effective fuel in the future and delivers a much bigger environmental benefit than all the other alternatives. Fuel is taken from two 293 cu. m. capacity LNG tanks which are arranged in separated rooms under the car decks. The liquified gas, LNG, is transferred from each tank through a cold box, where it is converted back into gas condition, which than flows through a gas reduction unit for exact temperature and pressure condition before feeding the engines. In transit the electrical power is generated from the shaft generators, during port lay times additional diesel gensets are in operation to provide the required on-board power. This is done by three MAN sets consisting of: 2 x MAN 6L21/31 (1,300 kW at 900 rpm) and 1 x MAN 7L21/31 (1,500 kW at 900 rpm). They are running with sulfur free diesel fuel. To complement the use of clean fuel, a full-scale Aalborg waste and heat recovery system (WHR) has been installed on board, resulting in a reduction in gas use by about five percent. The system converts waste heat from the exhaust gases to steam-generated electricity. The system consist of four economizers drawing on the exhaust stream from all four main engines, and supplying steam to a Shinko steam turbo generator. This covers the electricity needs for all cabins and public areas used by the ship’s passengers and crew. The ferry company has contracted the Norwegian company Skangass AS for bunkering. For the time being gas is provided by trucks, with 30% accomplished at Risavika (Stavanger) and 70% at Hirtshals. Complications followed, as existing Norwegian regulations up to now do not allow bunkering of LNG with passengers on-board, hence the ship has been taking on LNG in Denmark by truck coming from Norway. Denmark, as well as Sweden, allows bunkering with passengers onboard. With each truck taking an hour to transfer its load to the ship, and with 12 to 15 truckloads per week, the company has adjusted its itineraries: it takes now a bit more than one hour to bunker around 130 cm3, from two 65 cm3 capacity trucks, in Hirtshals. This LNG amount is enough for a round trip to Bergen. According to Fjord Line CEO Ingvald Fardal, plans called for installing a larger LNG tank in Hirtshals, which would enable faster bunkering, saving seven hours or more per week. However, there were reports that Norway will change its restrictions, possibly allowing bunkering with passengers on the ship maybe by the end of the year. That means the Stavangerfjord can bunker in Stavanger with gas trucked from nearby Risavika. Plans are also underway with Skangass to transport gas to the ship via pipeline. According to Fjord Line CEO Ingvald Fardal, plans called for installing a larger LNG tank in Hirtshals, which would enable faster bunkering, saving seven hours or more per week. Recently the Stavangerfjord won the IMO’s Energy Efficiency Award for 2013.